For inquires outside of the USA, Canada, Central, & South America, please visit www.TCIchemicals.com and navigate to the company page that matches your location. Please submit your inquiry by clicking on the "Ask TCI" button on the right-hand side of the homepage and submitting the form. Thank you! 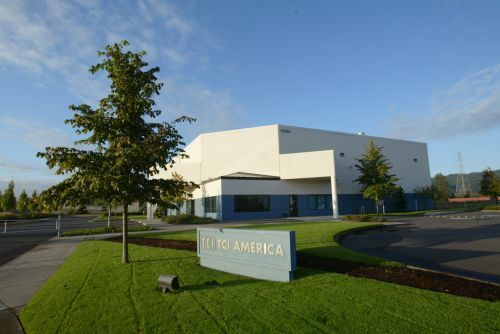 TCI America Headquarters, Portland, Oregon U.S.A.
TCI is a leading worldwide manufacturer of fine chemicals for research and production. We offer over 27,000 chemicals, including more than 8,000 products that are available only through TCI. TCI is committed to providing exceptional customer service and high quality reagents. Our specialty organic chemicals and intermediates are recognized as best-in-class by top research laboratories, universities and manufacturers. We offer hard-to-find and hard-to-synthesize products in laboratory quantities as well as bulk quantities. TCI’s manufacturing capabilities include multi-step synthesis and continuous production from milligram to ton scale. Please visit www.TCIchemicals.com today to order or to request a quote!